Gqozo was born in 1952 in Kroonstad. His background is largely military, serving with the SA Defence Force's 21 Batallion from 1977. He joined the Ciskei Defence Force in 1981. He was an army officer and became president of the 'independent' republic of Ciskei after deposing Lennox Sebe in 1990. He was held responsible for the tragic massacre near Bisho in September 1992 in which 30 ANC marchers were killed and more than 200 wounded by Ciskei forces. 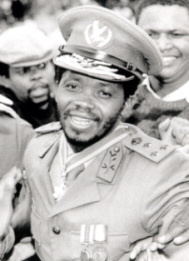 His presidency came to an abrupt and inglorious end when Ciskei was reincorporated into South Africa in 1994.